I have been interested in Astronomy for many years now. 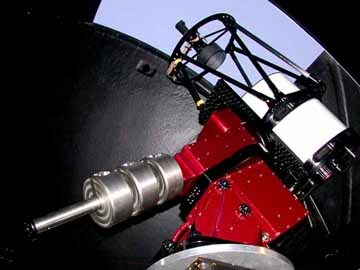 My first telescope was a Dixons 60mm refractor which I purchased from my paper round money when I was 13 years old. I eventually sold this and purchased another 2nd hand 60mm refractor to try and view Halleys comet. This was a very poor instrument, and was about as impressive as Halleys comet! I gave up observing the stars for many years until I managed to get my own house. It was then I decided I would like to get a telescope again, and maybe get involved in some astrophotography, a life long ambition. 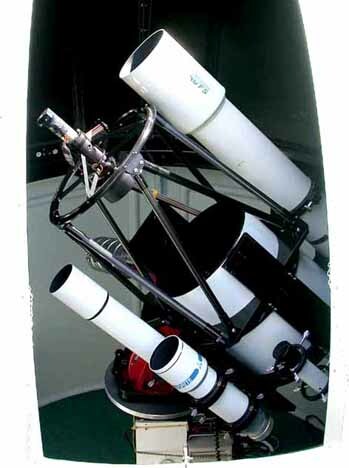 The first real instrument was a Meade 10" LX200. I purchased this in 1996, and decided that carrying the OTA and Forks assembly into the garden was both uncomfortable, and possibly a little dangerous in the snow and ice. It was with this in mind that I decided to landscape the garden to prevent bringing dirt into the house from the muddy winter grass, and also save my back. It was at this time that I decided to purchase a Milburn Wedge to aid in my astrophotography. This was a fine piece of engineering, and substantially stronger than the Meade Super Wedge. It also cost less! which always helps. The addition of a Lomo guider / wide field scope was also undertaken again using rings supplied by Ken Milburn. Having played with the LX200 for some time, I decided that I would like to upgrade the system. I wanted the GOTO facility without the problems of the mount sounding like a tractor in the middle of the night. In addition some problems with mirror shift occurred, but the use of an NGF focusser also helped minimise this. The idea was to buy a nice refractor for both planetary viewing, and deep sky imaging, a ccd camera, and maybe another SCT OTA at later date. I managed to pick up a Takahashi FS128 on an EM10 mount secondhand, and in quite nice condition. The EM10 was a bonus as I could use this as a portable mount for the time being whilst getting a GOTO system for a permanent mount in the garden. For a permanent mount I was restricted to a Paramount GT-1100, an AP 1200/900 GTO, or possibly a Quadrant system. The latter I was not familiar with, and the AP had a waiting list which was of unknown length. Having spoken with Tom Boles our local supernova hunter, and Jim Barclay in Australia, I decided that the GT-1100 should be a good choice - if not an expensive one. I duly put my name down for an AP, and ordered the GT-1100 from Software Bisque. The Paramount GT-1100 is quite a beast, and is incredibly accurate for both pointing and guiding. It is not a small mount as I found out when it arrived. The mount was a serious piece of kit. With the help of another local astronomer Dave Rose we managed to get the system up and running just before the rain came. Yes you've guessed another 'cloud magnet'. 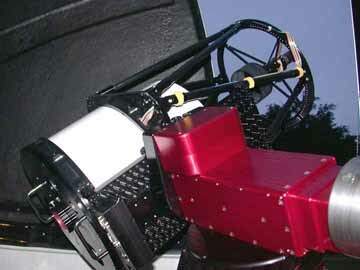 The mount is controlled by either a small hand controller by moving N-S-E-W, or via a computer using a very nice program called the SKY. No GOTO facilities are available from the hand controller. Additional software including T point for getting accurate alignment, and orchestrate for planning Supernova hunts is also provided. My system was designed to run primarily from a laptop PC which I also intend to use remotely from the PC upstairs using an internal LAN set up in the house. 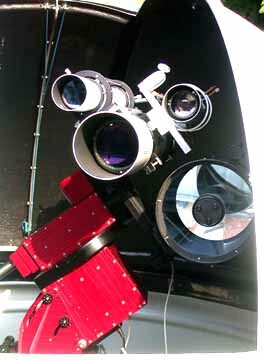 This is how the system was set to run with just the Takahashi FS128 and the Imaging system. After sometime I began to miss the focal length I had with the 10" SCT, so I kept my eyes open for a long focal length refractor. Something that I could use on the planets, and Sun in particular. The Takahashi does have a vari extender which acts like a high quality barlow which would give me extra focal length and a higher f ratio. What would have been ideal was to compare the two. Soon after these thoughts an Astrophysics 6" f12 refractor came up. I decided to buy it and mount both refractors on the same pier. This would of course mean raising the height of the pier. This was duly done. 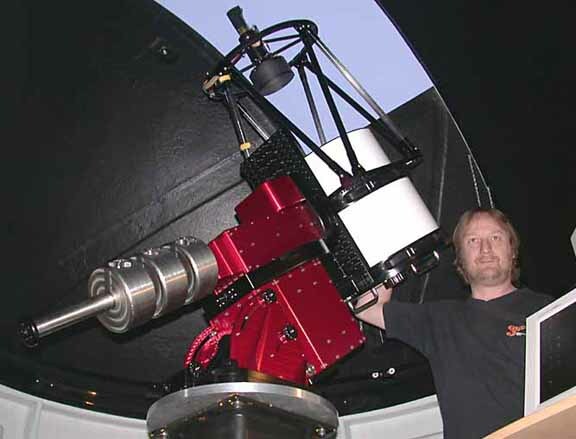 A special platform was manufactured by a friend Ray Flaxman which held two sets of Parallax rings to hold the Astrophysics 6" f12, and the Takahashi FS128. In addition a further Takahashi - the FCT76 was acquired for wide field imaging. This has a focal length of 487mm and is very well constructed with a helical focusser. It's a marvelous little scope, and incredibly sharp. This was attached using the set of Milburn rings formally used on the LX200 to hold the Lomo. 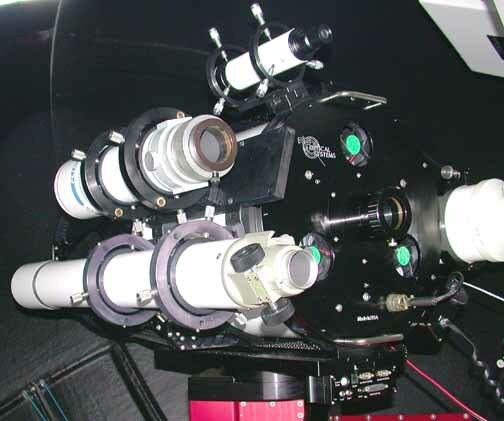 The two Takahashi refractors can also be used on the EM10 for visual and limited imaging work. 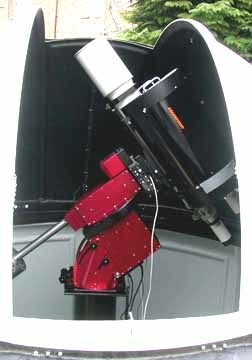 This was the system that I used for the Equinox Star Party at Thetford in September 2000. Following my return from Thetford I was notified by AP that the AP900GTO mount was available for order if I was still interested. With the limited weight capability of the EM10, and my interest in imaging both at home and away, I decided to sell the EM10, and put the funds towards the AP900GTO. With funds also being rather tight I decided that the slight improvement of the 6" over the 5" refractor was difficult to justify having both, so the AP 6" f12 was also sold, and I kept my eyes open for a largish SCT OTA as originally planned. Well that's where we are now, ideas are in place for possibly building a dedicated Solar telescope, but funds are not available yet. Something on the lines of a 6" f30 folded refractor for high resolution H alpha images, with an option for white light as well. All I need now is a box so I can reach the SCT - or shall I cut the pier back to where it used to be? Hmmmmmmm! Well that was how I left it last year. This year things have changed slightly. The Paramount GT-1100 has been sold, and so has the blue pier. The centre of the garden now contains my Observatory - Sirius Observatory from Australia. It is 7' 6" diameter, and 8'7" tall. It is motorised, and is almost completely finished. I still have the two Taks FS128 & FCT 76, and the C11. I expect the Paramount ME to be arriving in November, and the AP900 GTO will become my transportable system complete with the portable pier. Well it may have been later than I expected, but its here. The Paramount ME arrived at the end of April, and it is a work of art. It is now set up in the dome in place of the AP900GTO which has been put aside for portable applications etc. The mount itself is huge compared to the AP900GTO as you can see in the image below. The build quality and finish is nothing short of superb. 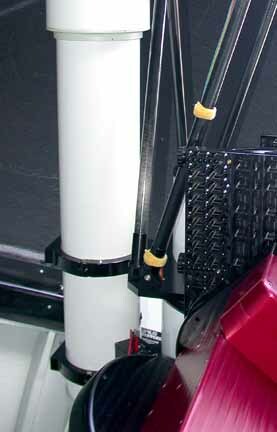 It is now holds the Takahashi FS128, the Vixen 80mm, the FCT 76, and the Celestron C11. Even with this load it will zoom around easily using the joystick. It sounds effortless. The Paramount ME fully loaded, and ready to run n the dome. At last I am getting somewhere. For more details of the Sirius observatory dome and its construction etc see the link below. Well a new year, and a new piece of gear, has a familiar ring to it doesn't it!. 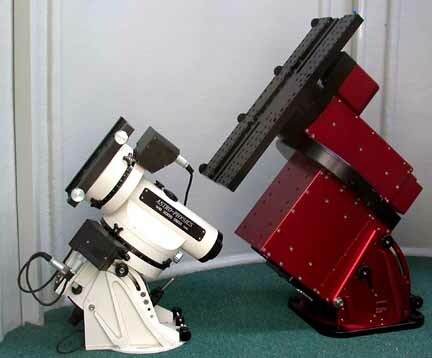 The C11 has been sold, and I am now the proud owner of 12.5" RC manufactured by RC Optical Systems. Probably the finest optical configuration there is for imaging. This system produces a completely flatfield over large areas associated with that required for todays larger CCD chips. The build quality is incredible, and it is also a work of art. I am also now the UK dealer for these scopes. Kev with his new toy, just installed. The original pier was shortened by removing the pier extention, and a new circular disc was placed on the top, and an additiona; ME plate was incoporated to allow the new system to fit in the dome. The next task is to get the lot aligned, and also get the refractors mounted around the side. Special thanks also to Dave Rose for his assistance in getting all in on Saturday, much appreciated.. Here you can see the two side of the RC holding the two refractor packages. It appears that the mount is quite happy with the combination, which is a relief, but I still need a little final twaeking to ensure all is ready for imaging. 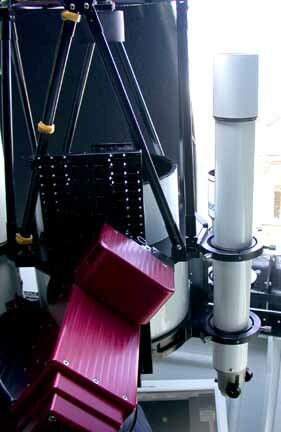 Here is a view of the rear of the telescope assemblyshowing the refractors. I am just waiting for the instrument rotator due any time now, and I can get all accurately balanced,a nd running. Here is shot of the scopes through the dome slit. Not a huge amount of room left, but enough I guess for one more if I ever need it. Certainly looking forward to getting all running. I will update the site when the new Paramount GT-1100ME arrives. I have moved on my AP900GTO as I will no be running an ME portable on a Pier-Tech 3 pier. This will allow me carrying capacity to take the RC, and all equipment out for either observing, or just for demonstartion purposes. I am no the UK dealer for the RCOS RC's, and also the Pier-Tech piers, so it seemd a sensible move. To demonstrate those I do need a pier / mount combination which I can use together in the field etc.